Flu viruses are unpredictable and can change over time. That is why we recommend that everyone 6 months and older get a flu vaccine every year. 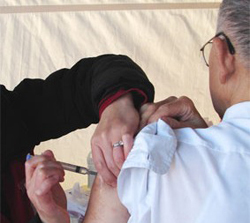 Flu vaccine will provide protection against three (trivalent vaccine) or four (quadrivalent vaccine) flu viruses and will be available in the fall throughout Contra Costa County at pharmacies, grocery stores, and other locations. It is important for everyone to take steps to protect themselves, their families and their community. The best tool for prevention of flu is vaccination. Yearly influenza vaccination is recommended for everyone 6 months and older. The best place to get vaccinated is at your regular health care provider or clinic. Find other locations in Contra Costa to get vaccinated.